I came home with Kath on Tuesday afternoon after lugging groceries home via several buses (most of which were late or never showed up), and decided that I needed a walk. Things weren't going terribly well. I had spent most of the previous day walking all over Parramatta Road, an dirty, industrial track lined with "car yards," or used car lots. The search hadn't gone well, and Kath was feeling progressively worse, battling a bug that hit us both the previous week. Seeing that it was too late in the day to head out to look for cars again (about a 3-bus, 2-hour ride to get out there), I grabbed the camera, walked to the beach, and crested a hill I had never gone over before. After going about a kilometer (ugh, the metrics are eating into my brain! 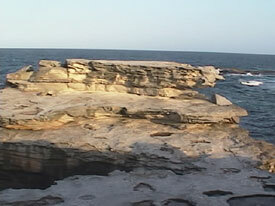 ), I came across the Malabar Cliffs, located between a golf course and the Tasman Sea. At this point, I will let the movie and pictures speak for themselves. Needless to say, I've never lived this close to something so nakedly beautiful. I am getting a little better at making compressed movies now. This one is over 4 1/2 minutes long and is only slightly above 5.2MB. There was some loss of quality, but at least modem users can view it. I didn't know what I was going to find as I circled the hill blocking my view of the water. 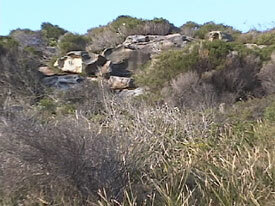 The hill is comprised of dry brush and sandstone boulders, mixed with tiny shrubs clinging to the dirt. 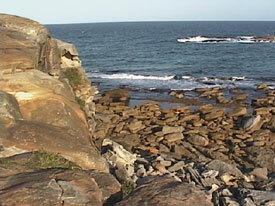 A little further around the bend revealed a small inlet ringed with small rocks and a calm sea. These wacky plants, which I have yet to identify, seem as if to guard the sides of the trail. 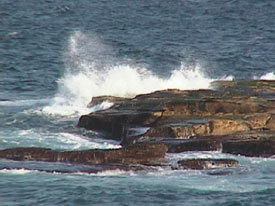 On the far side of the inlet, a rocky cliff face appears, windswept and wet with sea spray. 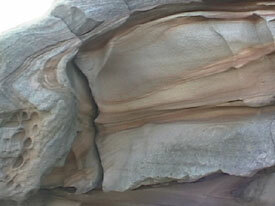 The sides of the cliffs in this area are comprised of sandstone, swirling with color that changes shades as the sun sets. 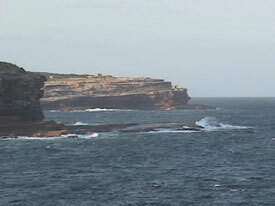 It is obvious that these cliffs have been pounded by the wind and sea for a very long time, and large cracks illuminate the areas of the cliff next in line for sacrifice to the ocean. The inlet ends in a small, tranquil beach, where dogs outnumber their masters, chasing balls and looking up with curious faces at the golfers on the hills above. 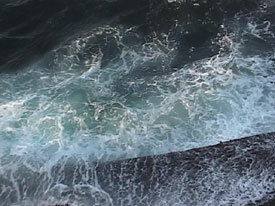 On the edge of one of the cliffs, you can see the violence of the sea, even on a calm day. Most of the cliffs rise straight out of the water, leaving the sea with no choice but slap it, driven into the land by the wind. 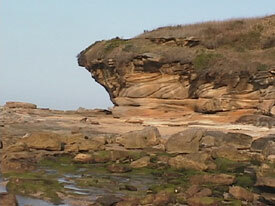 Different layers of rock were smashed together here, some horizontal and others at an angle, resulting in a strange looking overhang. 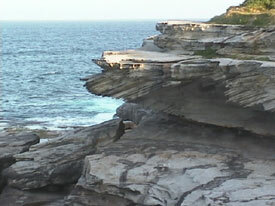 Many of the cliffs were crumbling, albeit slowly. Rather than presenting a solid face to the sea, they seemed almost made by giant children, stacking blocks to make a sea wall. I thought this one looked interesting because it reminded me of a dinosaur head. I wasn't alone. 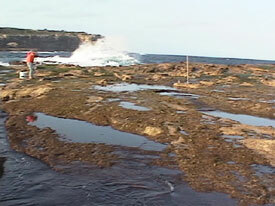 This guy was trying to fish, in between being constantly sprayed by water over the rocks. I was told by Kath after getting home, that several people have been washed away and drowned because of standing in the place where the wave is crashing in this photo. 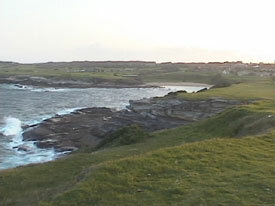 Away from the waves, the grass and brush slid down the cliff and over the sides, looking out to sea. 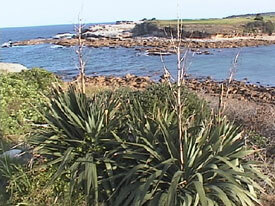 This photo shows a look down the coast, with the opening to Little Bay in the distance. 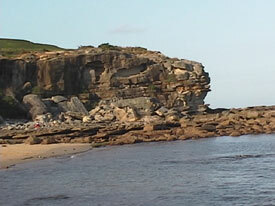 This is a look up the coast, showing the entrance to Long Bay, which ends in Malabar Beach. 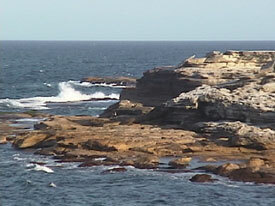 The little structure on the tip of the cliff in the distance is actually part of the firing range, located on most of that rocky finger as it juts out into the water. Saturday is target practice day, and we can hear the rifle shots from our apartment, which is south of the range. 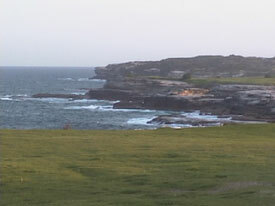 At first, I didn't like the fact that a golf course took up most of the land above the cliffs. Then, I realized that, if a golf course wasn't there, it would probably be privately developed and I wouldn't be able to walk there at all. I didn't mind dodging golf balls so much after that. This is rock that rises 60 feet or so from the water. It has almost broken free of the mainland. As the cliff is eaten away by the sea, only smaller and smaller rocks remain as you get closer to the water, victims of the sea's relentless pressure and the stinging, driving wind.